Now is the best time to prepare your lawn for coming storms. As the weather begins to warm up, it’s about that time when heavy rainfall and hurricanes begin to loom. In anticipation of the coming spring and summer — and all the harsh weather can go blow through — here are some crucial reminders about how to keep a solid eye on your lawn irrigation and landscape maintenance! You can better your chances of lessening any potential damage to your outdoor areas by taking to time to preemptive when the weather warms up. Lawn irrigation doesn’t just mean making sure your lawn is always properly watered — it also means taking the right measures to avoid flooding. 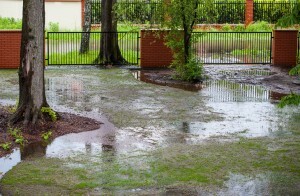 The key is to single out areas when harsh winds and large of amount of rain could puddle and kill off landscaping. Trees, particularly younger ones recently planted are more vulnerable to blowing over in high winds. Always check to make sure that their stakes are securely driven deep into the surrounding soil. While double-checking that the ties are fastened and properly secured. For older, existing trees, either cut back weaker branches that could make contact with your home, or contact a professional landscaper to make a proper assessment. Good lawn irrigation and maintenance means keeping an eye on possible flooding among your garden areas and any harvesting vegetables. Large storms one the way mean it’s the best time to harvest and collect your growth, since harsh winds and rain will leave little left once the bad weather blows over. Take the time to properly safeguard your water garden, as well. If your outdoor areas contain beautiful hardscapes, such as a pond, consider bringing in valuable fish inside using a large water bucket. Turn off and secure fountains so that electrical cords are unplugged and rolled up and move aquatic potted plants to the base of your pond until the storm has passed. All other existing hardscapes should be covered and secured in tarps to prevent costly damage. If your lawn irrigation system has exposed parts, be sure to have them secured, as well. This entry was posted on Monday, March 27th, 2017	at 1:33 pm	. You can follow any responses to this entry through the RSS 2.0	feed. Both comments and pings are currently closed.